Our WGP, Planet Eclipse and many other manufacturer-trained and certified Master Tech will check your marker. The service includes diagnostics, stripping, cleaning, maintenance and rebuilding. Wear and tear parts like O-rings are also included, other damaged parts will be calculated extra. We offer this service for Cocker up to 2004 only! Please send only the marker! No HP Systems, Hopper, etc. are necessary. 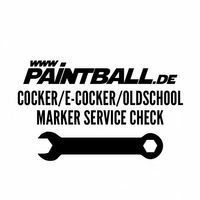 Once your marker(s) is received, we will contact you to verify and confirm the type of service and/or parts you are requesting for each marker.